Karmey Chesed, which translates into "vineyards of kindness," is an organization that has made it its mission to help all of Israel's needy. A fitting analogy when one stops to think about it. A vineyard is a collection of many singularities, each one needing its own special attention. When dealing with a charity whose mission is to help all the needy in Israel, it is important not to lose focus of the individual when trying to solve a nation wide problem. In today's fragile economic world, people in Israel need financial assistance more than ever. Whether it be covering the cost of medical bills, paying off loans and debt, to large expenses like marrying off a child, Aryeh Weingarten, Founder and Director of Karmey Chesed explains that the situation "is only getting worse." To combat the issue head on, Karmey Chesed has developed a number of projects to help fill the void and supply an answer to the constant request for help. One such program is the â€˜Green Charity' program which recycles used appliances and furniture. Volunteers pick up the items from those who are remodeling, upgrading or simply throwing away everyday household items that can be used. Instead of filling landfills and polluting waterways, these discarded items become a lifeline for needy families and are given to them for free. Another project of the organization is delivering food packages to families in need who often will not go to soup kitchen because they cannot bear the shame of standing on line or of turning to public assistance for help. These families often suffer terribly and do not have enough food to put on their tables. Karmey Chesed usually hears about these dire situations from caring neighbors or friends, and steps in to help. Dedicated and discreet volunteers regularly deliver well-stocked food baskets to the doorsteps of needy families. Karmey Chesed also holds regular clothing drives to help provide clothing for people in need and offers emergency cash gifts via interest free loans to those who require additional assistance. Often these families face a threat of having basic utilities such as electricity, water, gas or the telephone cut off. These situations only further hamper the daily functioning of hard working families who are facing tough times and simply can't make ends meat. When alerted to such situations, Karmey Chesed steps in to pay the bills, preventing further suffering. In the past month alone, Karmey Chesed has helped more than 400 families and individuals in need in Israel who find themselves in a financial crisis by giving them tens of thousands of dollars, food stamps, and furniture. Aryeh explained to Breaking Israel News that he began the organization in order to help as many people as he could. "I saw many people in need, people who were in financial distress and dire straights, and I helped them with whatever I could," he said. "I also went through some hard times, and I know what it is like, most of us do. I always found myself helping those in need, and I thought we need to find a way to help all those in need across the country," he added. The dignity of a person is an ideal that is held very highly amongst the staff at Karmey Chesed. It is not enough for them to help the person financially, but they wish to help the person maintain their dignity at the same time, and that provides a very large challenge. The network of volunteers and donors that Karmey Chesed has built is quite the achievement and it was all done organically. People began volunteering to help when they heard about the work that was being done, and they still do, donating their time when they cannot donate money. Because the organization is public, including Aryeh's cell phone number, the calls simply keep pouring in. "In order to help people" Aryeh explained, "we need to have others help us. We are completely dependent upon donations, as the government does not give us any funding whatsoever." Aryeh receives phone calls every few minutes from those who are in need of a helping hand. "These people often work and don't get paid very much, or are simply laid off from their jobs and have a difficult time finding another," he said. "And as we all know tough times can happen to us all." The organization's activities are spread out throughout the country and the demand is so high, that instead of functioning out of centers, the organization runs on a volunteer network based in the homes of the volunteers themselves. These volunteers are often responsible for the pickup and delivery of donated items that will go to those in need, as well as making sure that the person is able to maintain their dignity wherever possible. "Usually we receive four or five apartment fulls of items to be donated each day. Our volunteers work around the clock, and they must work quickly, or else the donated items may be gone by the time they get there," said Aryeh. "But it is still not enough. We have calls coming in all the time asking for help. We do our best, but we are really in need of more financial donations in order to give everyone the help they need. We call upon anyone who is able, to please assist with money or second hand household items for those in need." To help expand their reach to those in need in Israel, Karmei Chesed has recently joined forces with the Gush Katif Charity Center. 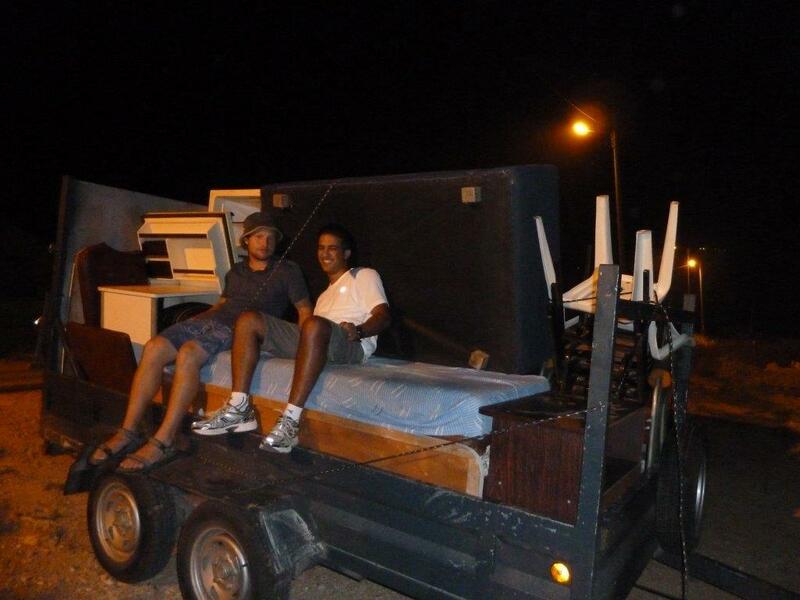 Together they have helped many of those who were expelled from Gush Katif with furniture, equipment and more. Sadly, many of the expellees still find themselves in difficult straits, after being abandoned by the government almost a decade ago. Another project that the organization is involved with is run in conjunction with the IDF and helps support the families of soldiers who live in poverty. "The soldiers come home from the field and they have nothing because their families are living well below the poverty line. The often don't have electricity or fridges," said Aryeh. "We give the army a lot of the donated second hand items which we receive and they in turn give it to the families of the soldiers who need it most." The items are distributed by the IDF Welfare NCOs Office and delivered to the families of soldiers who are most in need. The help that Karmey Chesed provides is invaluable and according to Aryeh, the army calls with more requests all the time. During the discussion with Breaking Israel News alone, Aryeh received numerous phone calls of people who were trying to donate items or needed help. "We simply cannot supply all of the requests that come in. We have a lot of people donating second hand furniture, and we still need more, and those in need of financial assistance, we help as much as we can, often even giving them sums of up to tens-of-thousands of dollars, in loans or gifts, but it is still not enough," Aryeh commiserated. "We are supported completely by donations, but it seems that the donations are drying up. The amount of needy families in Israel is growing and so are the calls for help. We do our best to help all of them out with something, but we simply do not have enough to give everyone as much as they need." Karmey Chesed continues to provide the help they can to each individual or family that calls upon them, providing them with dignity and the chance at a semblance of normal life.